Atlanta Web Design Services. We Design Sites that Convert. C hances are if you own a business here in Atlanta or anywhere else for that matter, you understand the importance of having an effective web presence. Your website serves as one of your main marketing tools, constantly generating profits and leads 24 hours a day, 365 days a year. It’s often the first thing that potential customers see of your business, permanently shaping their overall impression. With mobile devices such as smartphone and tablets becoming more and more popular, you have to ensure that your website functions on all of the latest platforms. 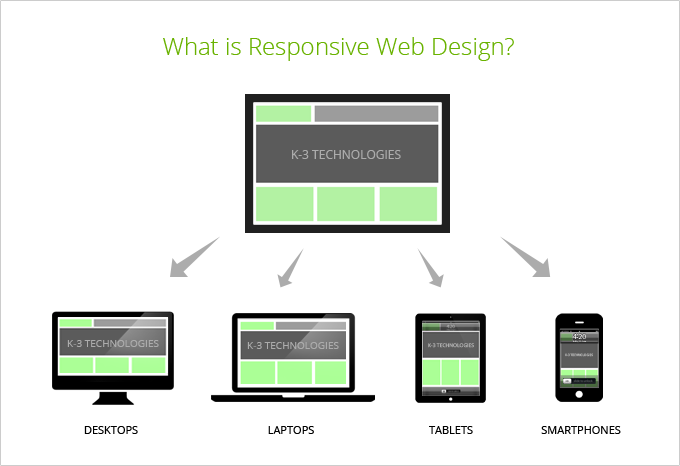 At K-3 Technologies we design responsive websites that work flawlessly no matter what devices your customers are using. With responsive websites, gone are the days where you had to maintain a separate sites for both desktop and mobile devices. Our design services ensure that you only have to manage one website which automatically re-sizes to fit the screen in question. Of consumers research a company online before making major purchasing decisions. Of companies who optimized their websites for mobile devices saw improvements in revenue. Of consumers view a company’s website as a reflection of it’s attention to detail and customer service. Of website visitors leave a site if it takes more than 2 seconds to load.